This post is sponsored by Welch’s. PB&J Chickpea Smoothie, a vegan protein shake that takes you back to your childhood. 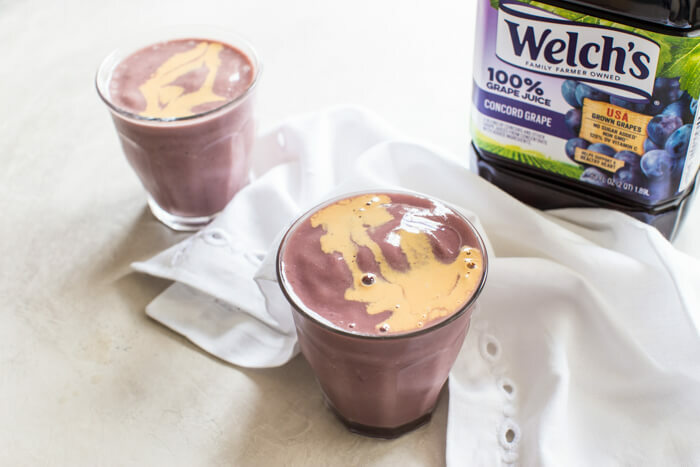 We love this recipe because it’s made with 4 whole food ingredients—chickpeas, 100% grape juice, peanut butter, and flax. Gimme. I’m always looking for ways to sneak more nutrition into our routines, and a daily smoothie habit is a foolproof way to get in the good stuff. 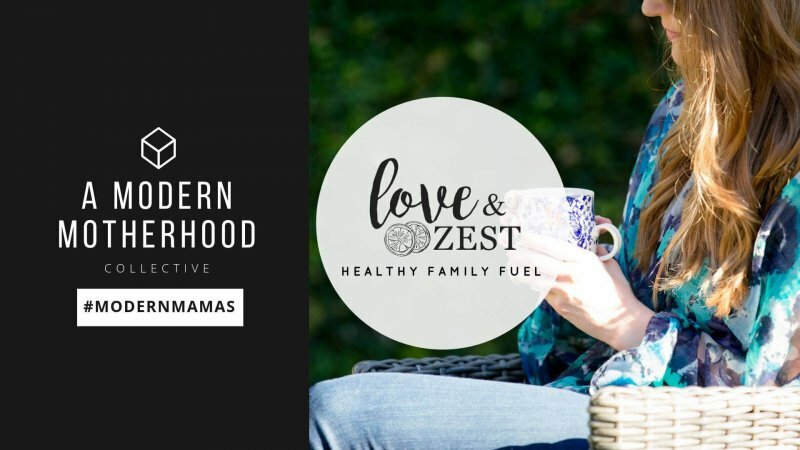 We love smoothies at our house and it’s an easy mom win for me when my husband and son both slurp them down. My son may not eat a side of veg at dinner and often picks out the “green ones” mixed into his mac ‘n cheese, but I have yet to hear a complaint about any smoothie I’ve made him. When fruits and veg go undercover in a smoothie it’s easy for us to all meet our daily quota. My power play when it comes to making a tasty smoothie is to use frozen produce/vegetables, 100% juice and peanut butter; these always go into the blender. This PB&J Chickpea Smoothie ups the ante with fiber packed nutrients such as chickpeas and flax. 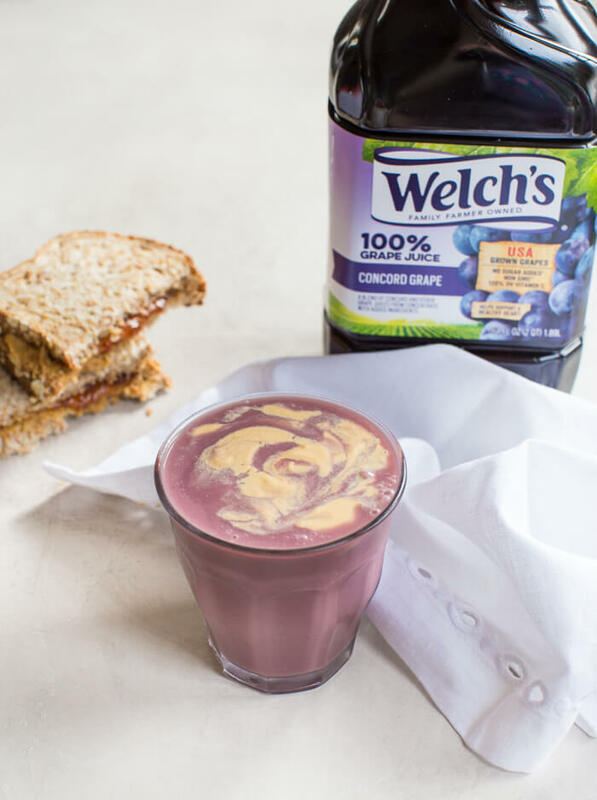 I love working with Welch’s 100% Grape Juice, which has no added sugar and is made with the Concord grape, an original American superfruit that helps support a healthy heart. Naturally powerful plant nutrients called polyphenols are behind this special grape’s dark purple color and benefits; in fact it has many of the same polyphenols and heart-health benefits as red wine. 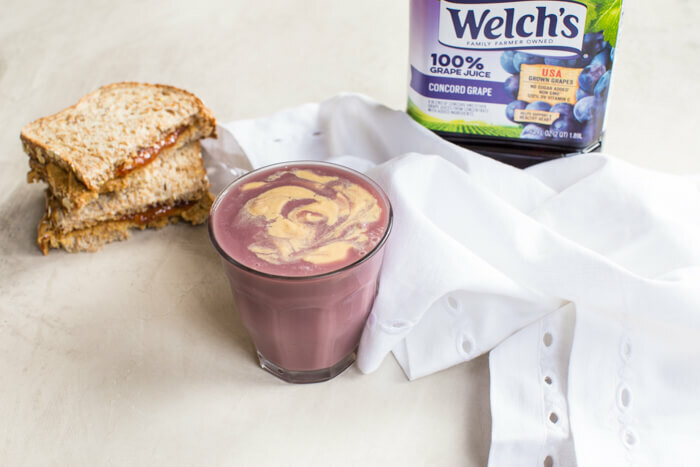 100% grape juice provides that tart sweetness and when blended into a smoothie with peanut butter, it tastes just like a frosty version of the classic PB&J sandwich. I promise, you can’t taste the chickpeas in this smoothie, but they add good texture and loads of fiber. This PB&J Chickpea Smoothie would make a great snack and an awesome post workout recovery shake for athletes too. 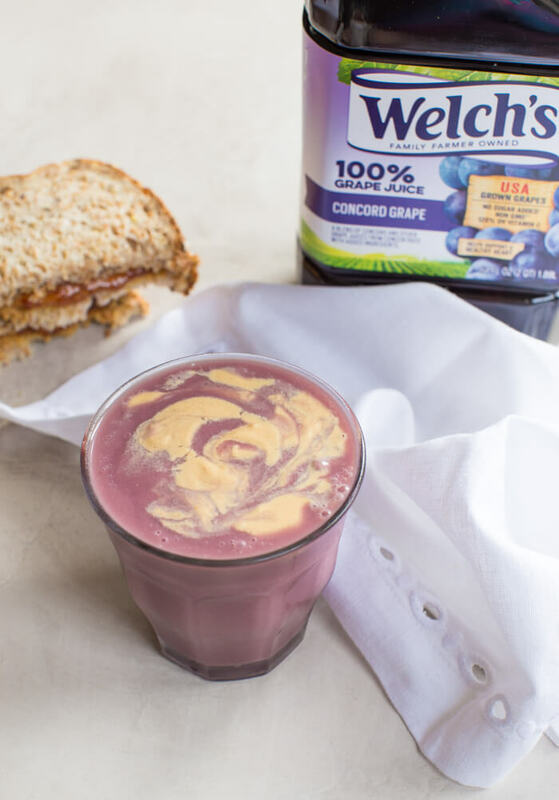 It’s packed with protein and carbs needed to replenish muscles post workout, thanks to the natural fruit sugars found in Welch’s 100% Grape Juice. In fact, preliminary research shows that 100% grape juice may help enhance exercise performance. This adds to the years of science that says 100% grape juice made with Concord grapes can help support a healthy heart and promote healthy circulation too. We kept this smoothie pretty classic with 4 simple ingredients, but you can make it your own, by adding in more peanut butter if you need additional calories for refueling or want more PB flavor. Blend in a frozen banana for a thicker shake, just be sure to cut back on ice. Add a handful of spinach or kale for an extra dose of vegetables that you can’t see (or taste). Add an additional chickpeas if you need higher protein, or simply make a double recipe. 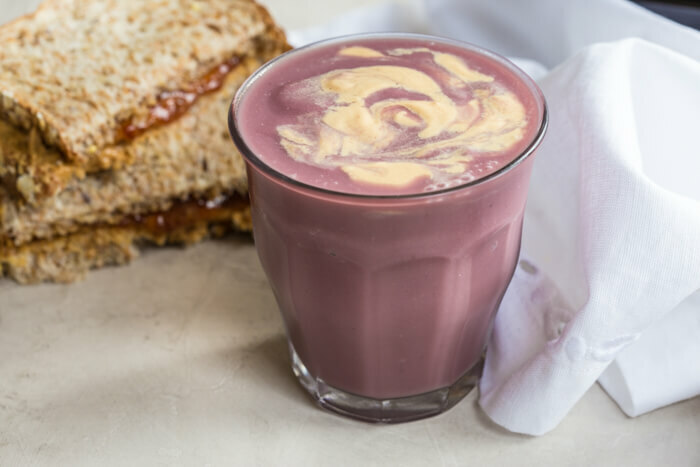 Slurp down this PB&J Chickpea Smoothie to aid in recovery from your workouts and to celebrate American Heart Month this February! The recipe meets expert guidelines for a heart-healthy recipe. Place grape juice, peanut butter, chickpeas and flaxseed in high powered blender and blend until smooth. Add ice and blend until thick and creamy. What a fun recipe! I have to try this one! Delicious & Healthy are great finds so thank you for sharing! I’m loving this smoothie and especially the swirl action on top. And I would have never thought to put chickpeas in a smoothie. Great idea! I want to try this one. I really need to start incorporating smoothies into my daily routine! Healthy and easy is a winning combination and I love the flavor combo in this one! I’ve never even thought to put chickpeas in my smoothies, but this looks and sounds just awesome. 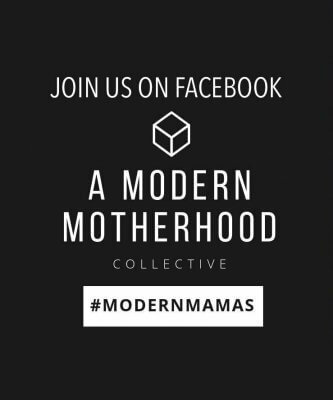 Perfect for kids and adults, alike! I’ve never added chickpeas to my smoothie, but I have a can I’ve been meaning to use and this is the perfect solution. Thanks for sharing! Yum! This looks so tasty and makes a perfect kid friendly treat! 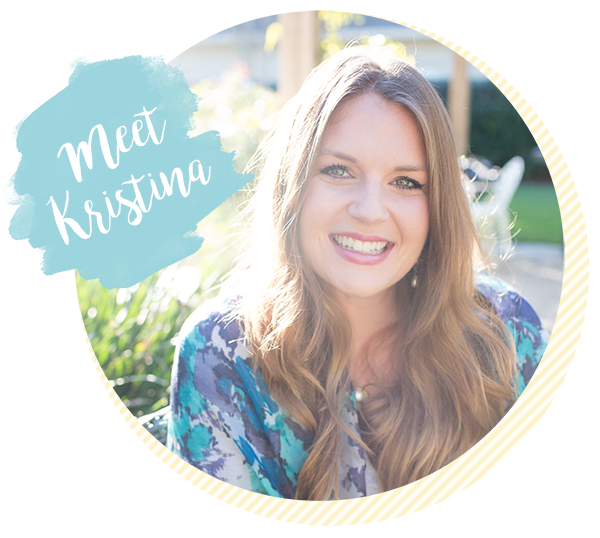 You made ultimate protein rich smoothie with peanut butter and chickpeas, Thanks for introducing me to to adding chickpeas into the smoothie. I’ve added beans to smoothies but not chickpeas yet. I’m so pumped to try this! What a fun idea and a great way to sneak some beans into my little guy! What a unique smoothie recipe! I never thought to add chickpeas to my smoothies but this sounds interesting. I have to give it a try. I’ve never thought of this combo before, but i’m seriously intrigued. Such gorgeous photos as well!